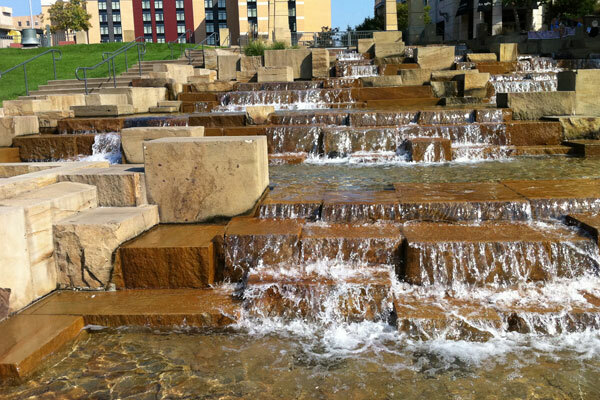 Experience Pittsburgh, a city of hills and rivers; Pittsburgh has been remade and re-imagined. With 24 miles of riverfront trails, beautiful parks, and historical attractions, you will find Pittsburgh to be both authentic and unpretentious. 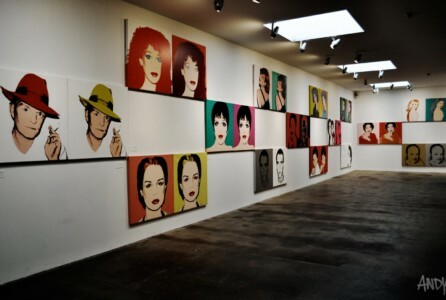 Attractions include the Andy Warhol Museum, the National Aviary, Strip District, Grandview Avenue, Guided Bike Tour and Three Rivers Sightseeing Cruise. 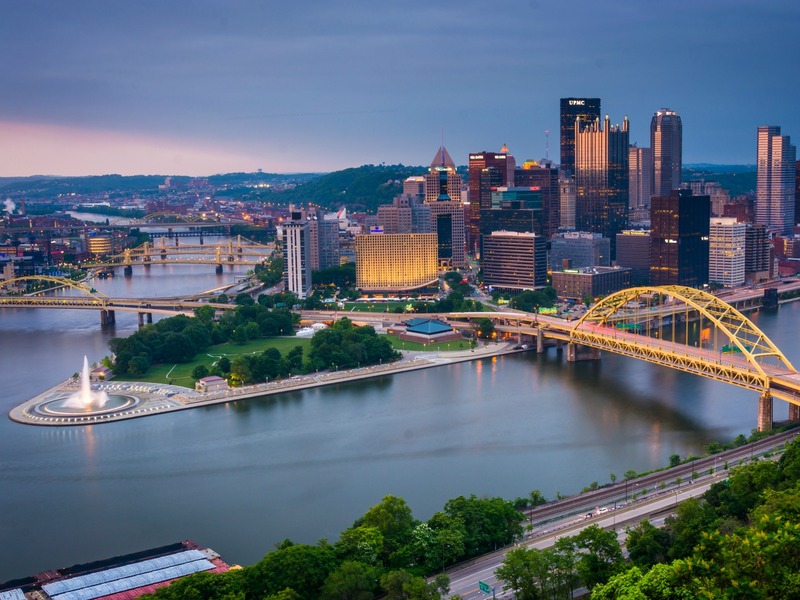 Pittsburgh will provide an exciting blend of culture, activities, and entertainment, making it a a tremendous pre-trip getaway for our attendees. 3 pm – 6 pm Hotel Check-in. Your Pre-Trip Co-Chairs Merrill Goldsmith and Paul Silver will great you in the lobby. 6 pm Everyone meets in the hotel lobby to head to dinner. There will be a combination of Mosaic Vans / Hotel Shuttle and private cars. Anyone running late should go directly to the restaurant. 7 pm – 9 pm Dinner at Tamarind Savoring India (Google map between hotel and restaurant) (Included in base price) The family-style dinner will have vegetarian and fin fish dishes. Glatt Kosher Option: Cafe Eighteen (Google map for mass transit between the hotel and Glatt Kosher Restaurant) Will need to arrange your own transportation and a discount to base price given. We will hold a Meet You Leader Meeting at the end of dinner at Tamarind Savoring India and again back at the hotel lobby at 9:30 pm. Please make sure to attend one of these meetings. A: Go back to the hotel and rest up for an fabulous long week. **Please plan for alternate private transportation after 10:22 pm when the hotel shuttle service and public transit near the hotel ends. Enjoy a three-mile walk along the North Shore of the Three Rivers Heritage Trail starting near the Rivers Casino and ending in the Strip District of downtown Pittsburgh. 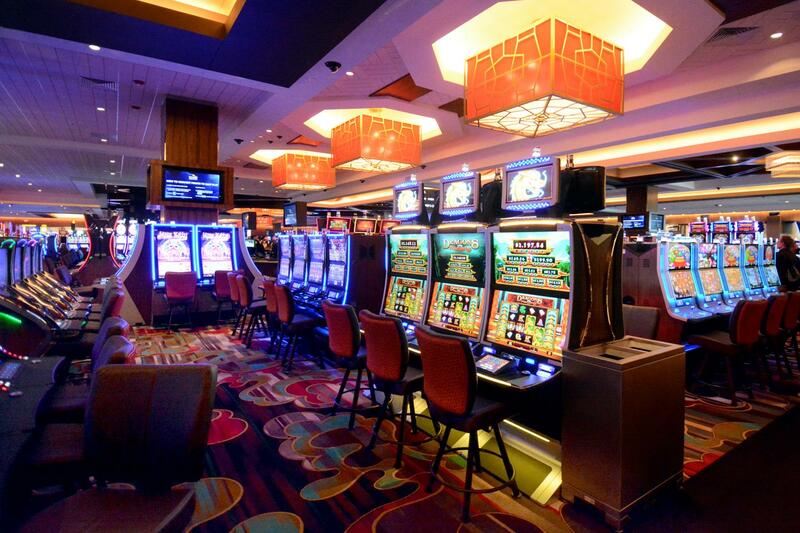 We will use public transit and/or hotel shuttle to get to the Casino. Start as you walk along the North Shore Riverfront Park. You will pass by the Carnegie Science Center where can explore the USS Requin (US 481) Submarine ($7 entrance fee at the door), Vietnam Veterans' Monument, Mr. Rogers Statue ("Tribute to Children"), Water Steps, Korean War Memorial, and Roberto Clemente Statue. Then walk across the Roberto Clemente Bridge to continue walking along the south shore of the Allegheny River. Go past the Convention Center Riverfront Plaza and the make your way to for a quick visit at the Senator John Heinz History Center. Then about ten blocks uptown to the Strip District for your choice of restaurant for late lunch. Then catch public transit at 4:00 pm to meet everyone else at Station Square for the evening’s activities. 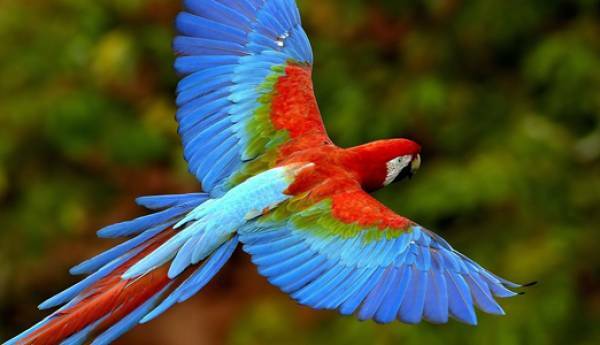 Option W2 North Shore Museums: Andy Warhol Museum and National Aviary. Transit via hotel shuttle or public transportation to museums/catch public transit to Station Square at 4:00 pm. The museums are handicap accessible. Schenley Park is a large municipal park located in Pittsburgh, Pennsylvania, between the neighborhoods of Oakland, Greenfield, and Squirrel Hill. The park contains 456 acres of trails, woods, and attractions. The park is listed on the National Register of Historic Places as a historic district. In 2011, the park was named one of "America's Coolest City Parks" by Travel + Leisure. Schenley Park features a grand entrance, Schenley Plaza, and several miles of hiking trails and a large lake in Panther Hollow. Phipps Conservatory and Botanical Gardens encompass15 acres including a 14-room glasshouse and 23 distinct gardens. Experience industry-leading sustainable architecture and green practices, stunning seasonal flower shows, exclusively commissioned exhibits, renowned orchid and bonsai collections and more. Opened in 1893, the historic landmark is just a few miles from downtown Pittsburgh in Schenley Park. Learn more at phipps.conservatory.org. (Pay at door $18/ Seniors $17) Most of the conservatory and gardens are handicap accessible. Optional walk to Squirrel Hill for lunch at the kosher Cafe Eighteen or have lunch in the conservatory cafe. Transportation is Mosaic Van or Pulic Transportation. Leave the park for Station Square at 4:00 pm. 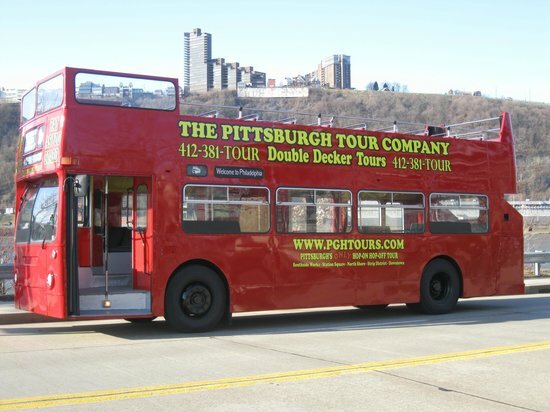 Explore Pittsburgh on the circulator bus run by the Pittsburgh Tour Company. Hop On and Off at any of their 21 stops throughout the city of Pittsburgh, then hop back on to resume your tour at your leisure. Their fully narrated historic and humorous tour takes you through the best areas and near some of the top Pittsburgh attractions! Visit your favorite areas, the best attractions, museums, restaurants and shopping in Pittsburgh. There are 21 stops with a guide pointing out sites of interest. The entire circuit takes 2 1/2 hr. There are an hour and a quarter between buses which means that one needs to plan stops carefully especially toward the end of the day. We shall pick up and end our tour at the StatThere is an hour and a quarter between buses which means that one needs to plan stops carefully especially toward the end of the day. We shall pick up and end our tour at the Station Square stop (#4). Meet the first bus run at 9:20 AM at Station Square at the Gateway Clipper entrance and end on the final bus run at 4:50 PM. Transportation to/from Station Square is by private car. 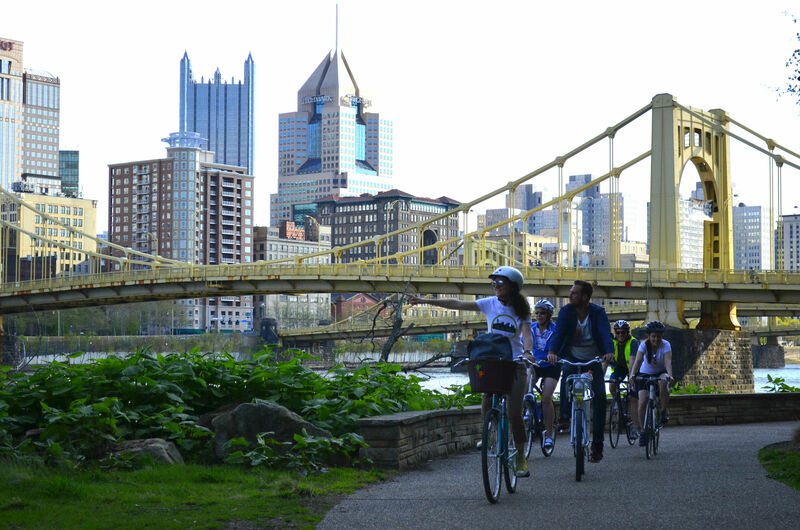 Explore Pittsburgh and do "Beauty of the Burgh" guided bike tour by Bike the Burgh Tours. On this tour, you will cruise through the streets of the financial and cultural district, explore the strip district and check out the North Shore. You will dive into the history of Pittsburgh, tracking down the people who shaped ﻿this ﻿city into what it is today: a beauty. Old and new buildings, city squares and public art will turn this ride into a unique event full of exciting discoveries of The Burgh. The vendor provides helmets. Want to bring your own bike? The vendor will give a $10 discount, but you will need to provide your own transportation and pay the $13 parking fee. After the tour, we will have the lunch in the nearby area. After lunch we will head back to the hotel at 3:00 pm to give you a chance to refresh yourself. At 4:30 the van will then drive to the Station Square area for the evening activities. Explore Pittsburgh by bike. You can rent a bike from Bike the Burgh Tours. The tour company will provide maps and points of interest suggestions. Your transport will return to the hotel at 3:00 pm to give you a chance to refresh yourself for the night. 5:00 pm – 5:30 pm All groups will end up at Station Square to regroup for evening activities. Station Square is the location of dockdock for the Three Rivers Sightseeing Cruise boats, Monongahela Incline lower level station and one of the stops for the hop on/hop off sightseeing bus. We shall meet at the Gateway Clipper Dock entrance at 350 West Station Square Drive, Pittsburgh, PA 15219. If you do not want to go on the cruise and would like to join us for dinner, you can meet us at that location a few minutes after 7:00 pm end of the cruise. The best way to see Pittsburgh is aboard a 1 hour Three Rivers Sightseeing Cruise sailing the Allegheny, Monongahela and Ohio Rivers. You’ll be treated to expert narration by both their Captain and On-Board Narrator as you enjoy the view of the lush landscape, towering skyscrapers, and all the amazing sights along the banks of the three rivers! Have a tasty snack or a refreshing drink from their snack bar and full-service bar available for purchase. The cruise is handicap accessible. After the cruise and before dinner we shall have a 5-10 meeting to discuss Thursday plans. If you cannot meet at this time, we can meet back at the hotel when we return from dinner. Walk around Emerald View Park on top of Mount Washington and enjoy the sunset over Pittsburgh (Sunset is at 7:56 pm / Last Light at 9:30 pm). Enjoy dinner at one of the restaurants on top of Mount Washington like Redbeard's Bar and Grill or Sesame Garden Chinese Restaurant. Head back to Station Square to pick up your vehicle to head back to the Hotel. Late Evening choices are the same as Tuesday night. All costs are pay as you go. Please bring on luggage to the front desk for safekeeping during the day or put into your car. Everyone should check out of their rooms before heading out for the day. Enjoy a two-hour paddle starting underneath the Roberto Clemente (6th Street) Bridge along the Alleghany river right next to the PNC Ballpark. Venture Outdoors North Shore location gives you a spectacular view of the Pittsburgh city skyline. Paddle around the Point at Point State Park, venture up the Allegheny River towards Washington’s Landing or head for the Ohio or Monongahela Rivers. the vendor will determine actual route on the day of paddle pending several variables. Individual and tandem kayaks are available. Must have basic knowledge how to paddle a kayak and be able to swim. Cost is $33 (includes 10% tip, transportation, and administration fees). A maximum of 15 people / Minimum is 10 people. The group will stop briefly to allow pick up of a take-out sandwich for lunch. Transportation by Mosaic van and private car. Explore Pittsburgh on a guided walking tour by Walk the Burgh. Join and explore the heart of Downtown or Oakland by foot. Walk by and into must-see cultural and historical landmarks as well as iconic buildings! Discover beautiful squares and fascinating pieces of public art! We will highlight the Best of our Burgh but also point out unseen details and hidden gems. Walking down significant avenues as well as turning into small alleyways will give you a an excellent introduction to the unique city of Pittsburgh. The tour is handicap accessible. Transportation Mosaic van with a limit of 12 people. 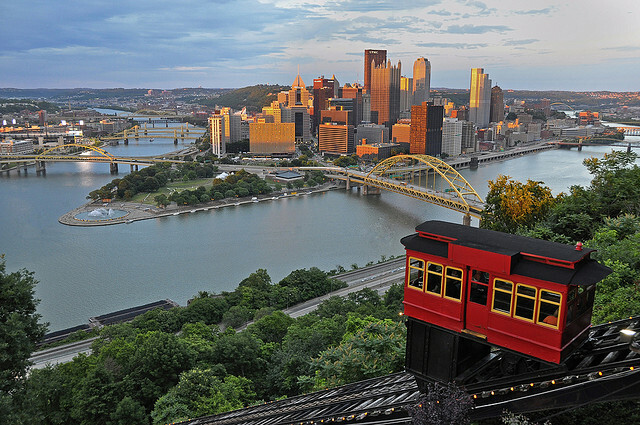 Board the Monongahela Incline and head down Grandview Avenue and take in the mountaintop view of Pittsburgh’s skyline and head towards the Transportation Museum. The Museum is .50 (exact change! ), and the incline is $5.00 round trip or use your all day transportation pass. On the way back you can stop at Difiore’s Ice Cream for sandwiches and desert on Shiloh Street. Arrive at Holiday Inn Express & Suites Pittsburgh West - Green Tree any time after 3:00 pm on Tuesday, August 28th. Free Hotel Shuttle service from Pittsburgh Airport included in your hotel room purchase. On arrival at the Pittsburgh International Airport (PIT), pick up your luggage and go to Door #8. AFTER you have your luggage, then call the hotel at 412-922-7070. The hotel will then give you an ETA of their white/green/blue Hotel shuttle. Please note the hotel shuttle service only operates between 7 am – 11 pm. Use Super Shuttle for Transportation from Airport to Hotel between 11 pm and 7 am for an approximate cost of $22. Standard Taxi service will cost you around $40 or more. Mosaic Shuttle will leave the airport on Thursday, August 30th at 2:32 pm and then pick anyone who needs a ride from the Hotel at 2:52 pm. Please be in the lobby with your luggage by 2:30 pm. The shuttle WILL NOT WAIT FOR ANYONE who is not ready for pickup when the bus arrives at the hotel. Anyone left behind because they were not waiting for the bus at the appointed time will need to arrange their own transport to camp and forfeit the cost of the Mosaic Shuttle. Mosaic is offering a Van option from Toronto to Pre-Trip to Camp to Toronto. See the >Transporation page for more information. $279 Extra for Single Occupancy $411 - Waitlisted - Email us if you want a single. **Note: We can only guarantee room rates until July 30th. Any rooms booked after July 30th based availability of a room from the hotel and prices may go up. Does not include hotel accommodations or breakfast during the Pre-Trip. You must make your arrangements. A surcharge of $50 on top of the No Hotel Option to anyone who books their own room at the Holiday Inn Express & Suites Pittsburgh West and attends the Pre-Trip. All prices in are USA Dollars. Please register for the Pre-Trip while you register for the Main Event on the Registration Page. You must particpante in the Main Event to be able to attend the Pre-Trip.